Although Pandle has been designed to reduce user error as much as possible, it's not completely infallible. So we have implemented a bulk editing tool that allows users to edit or delete multiple transactions with just a few clicks. What can be edited in bulk? All transactions can be edited in bulk, but only certain entries can be edited depending on the type of transactions selected. 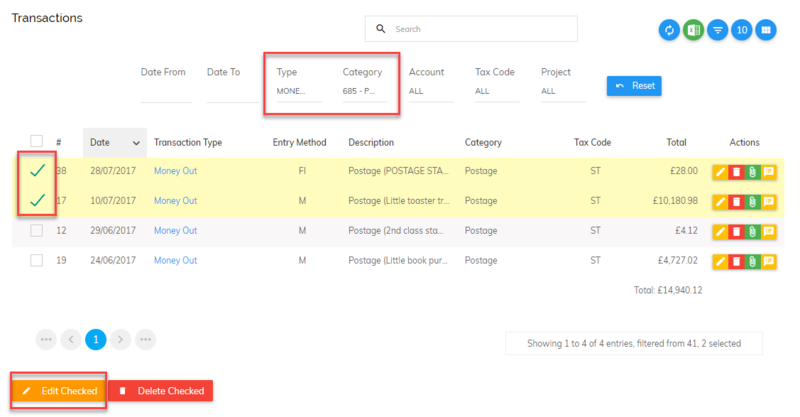 You can bulk edit the date, bank account (if applicable), type of transaction, the category, description and tax code. You cannot bulk edit the amount as multiple transactions will likely have different amounts. To give yourself the most editing options it is better to edit one type of transaction at a time, customer invoices for example, rather than mixing transaction types. In the example below, we are editing the category for a few customer expenses at once. We are changing the category from 'Postage' to 'Stationery'. As you can see in the example, only the category is changed here. The other entries are left blank as they are not being changed. As in the above steps, filter down your transactions to show the ones you would like to delete. Then check the relevant transactions before clicking 'Delete Checked'. Please note, if you are trying to delete invoices with credit notes and/or payments attached to them then you may need to delete these first before the invoices can be deleted. This is to protect the integrity of your data.